Tickets Are Selling Fast! DON'T MISS OUT!!! Join us December 31st, 2018 as we bring in 2019 with class and style at the most upscale OPEN BAR New Year's Eve in Denver. Colorado’s socialites will bring in the new year at The Denver New Years Eve Black Tie Party inside of the magnificent Westin Hotel, 10600 Westminster Blvd, Westminster, CO 80020. The Westin is located on the boardwalk, just a 5-minute walk from Butterfly Pavilion and a 5-minute drive from 1stBank Center. The Denver NYE Black Tie Party will take place in the largest ballroom 12,000 square feet with 22' vaulted ceilings, elegant chandeliers and natural light. Professional sound, lights and décor will accentuate the grandeur of Denver’s most exquisite New Year’s Eve experience. The Denver NYE Black Tie Party features two incredible live bands, multiple headlining DJ’s, Vegas-style casino games, a huge confetti blast and champagne toast. Starting at 8 pm. guests will have access to three rooms with multiple all-inclusive open bars serving liquor, beer and wine serviced by 30+ swift bar staff. 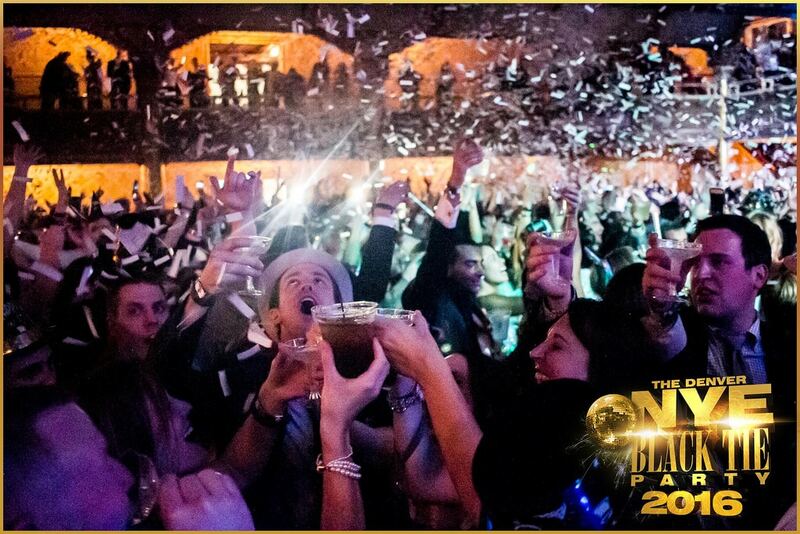 The Denver New Years Eve Black Party features the longest OPEN BAR in Denver with 5 ½ hours of unlimited drinks. This year there are a limited amount of 1,000 tickets available making this one of the most exclusive New Years Eve 2019 events in Denver. Take advantage of the opportunity to enjoy an overnight stay at one of Denver’s top-rated premier hotels just upstairs from the Denver NYE Black Tie Party. This event has SOLD OUT for the past 7 years and is guaranteed to sell out again this year. Located on the Grand Foyer next to the check in area. $5 per item. Includes: Spirits, Beer, Wine, Water, Soft Drinks and Champagne Toast. The live bands will perform original and cover songs. The DJ’s will be spinning the best of Top 40, Hip Hop, EDM & Pop. Tickets will not be sold at the door. Pre sale only. No refunds available. Parking will be available at The Westin Westminster and in surrounding parking lots. Formal wear is encouraged but not mandatory. Please dress with class and style. Black Tie is encouraged but not required. Tuxedo is optional. There is limited scattered seating on the Plaza Ballroom and the Grand Foyer. Nearest ATM is located in the main lobby of the Sheraton Denver Downtown Hotel.